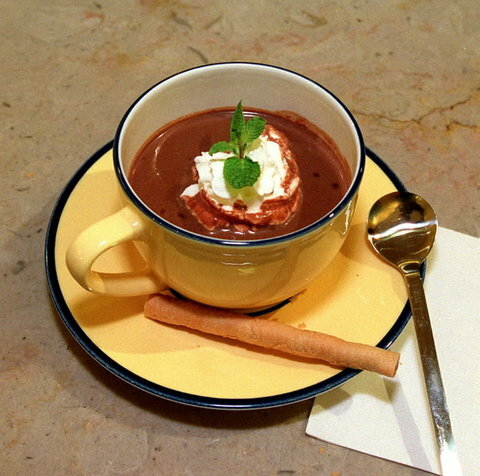 Serve this rich soup in small cups or bowls as the first course in our all-chocolate menu. If you want to go more savory, spice up the whipped cream topping with smoked paprika or cayenne and a little gros sel. Garnish with a sprig of mint. Don’t go out and buy espresso powder just for this recipe — you can always substitute with a tablespoon strong coffee. This recipe makes six cups of soup, which is about 12 servings. It was demoed by Danielle for Valentine’s Day 2014 at the US Botanic Garden. Combine whole milk, condensed milk, chocolate chips, liqueur (if using) and salt in a saucepan. Bring to a simmer over medium-low heat, whisking constantly. Reduce heat to low and cook, whisking often, until chocolate melts and mixture is smooth and thickened, 20-25 minutes. In a separate bowl, whisk together the vanilla and the espresso powder. Stir into soup. Serve garnished with small spoonful of whipped cream. For a savory twist, at a pinch of sea salt, Maldon salt flakes or kosher salt on top of the whipped cream. This entry was posted in Recipes from Danielle's pantry, Soups, Vegetarian and tagged chocolate, milk. Bookmark the permalink.